On the heels of Starwood announcing its winter and spring promotion for Starwood Preferred Guest, Hilton HHonors and IHG Rewards unveiled their first quarter promotions last week. "Double Your HHonors" is Hilton's double points promotion for the winter and early spring of 2016. The promotion covers stays at any Hilton property worldwide starting on or after January 1, 2016 and ending on or before April 30, 2016. You must register at HHonors.com/Double before checking in for a stay during the promotional period. When registering you choose between double HHonors points or double airlines miles. (Note, if you decide on double miles, you need to select "Points and Miles" as your earning preference in your profile.) Your selection remains in effect for the entire promotion and cannot be changed. If you choose double points, your base points will be doubled for each stay; double miles will double the miles you would typically earn for a stay. Should you register for double points or double miles? If you wanted a detailed breakdown based on point value see this post at One Mile at a Time. For me, it's a much simpler question. I opted for double points since I have far more hotel stays per year than I do airline trips. As such, I typically go with hotel points when I have a choice between those and airline miles. 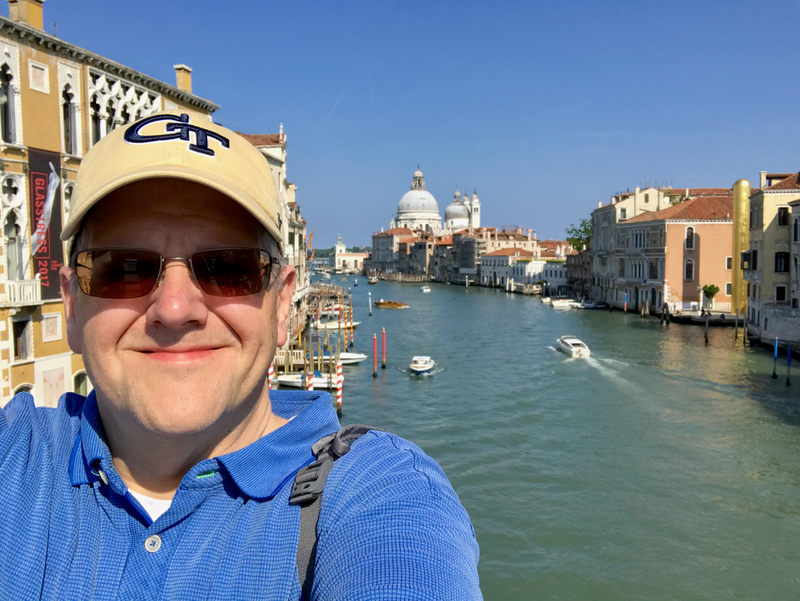 Furthermore, I tend to find airline credit card offers more attractive and lucrative than hotel cards, so I typically build airline miles with credit card sign-up bonuses. IHG's first quarter promotion also runs from January 1 to April 30 but is more complex than those of Starwood or Hilton. Rather than a straight multiplier bonus, Accelerate assigns a targeted list of offers that can earn a fixed number of points. First, you need to register for the promotion at Accelerate 2016. Once registered you will be presented with your list. If you complete a certain number of these promotions you earn additional bonus points. Here is my list. Your Accelerate page includes a dashboard that will help you track your progress throughout the duration of the promotion. IHG Accelerate dashboard helps you track your progress toward maximum bonus points! Winter is typically my lightest travel period, however, I have the chance for some significant bonus points if I travel in January. 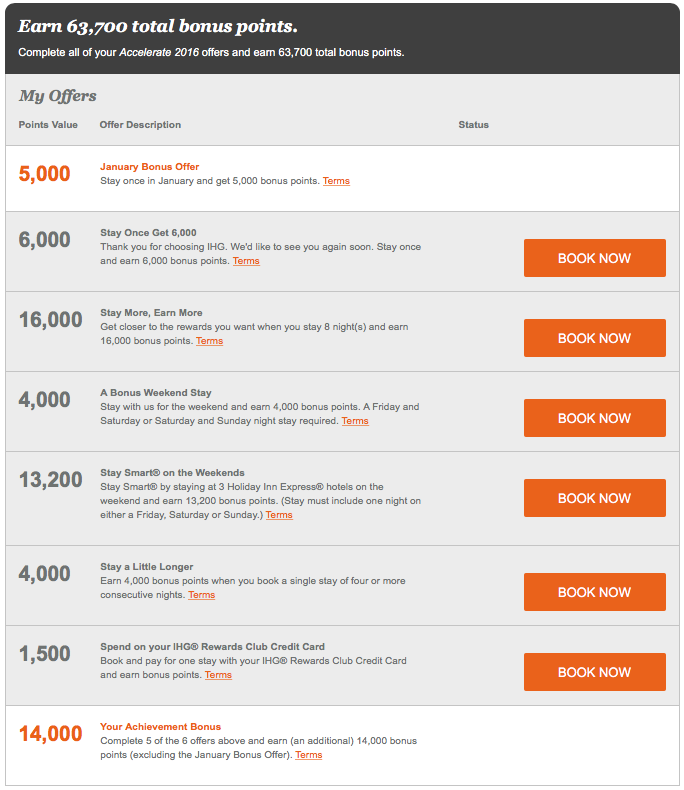 A single night at IHG in January would net me 12,500 points: 5,000 for the "January Bonus Offer," 6,000 for "Stay Once Get 6,000," and, if I pay with my Chase IHG Rewards Mastercard, another 1,500 points. That's on top of my base points and Spire Elite bonus! That night would also complete two of the five offers needed to earn the 14,000 point bonus (the January stay bonus does not count as one of the six offers). As noted, these offers are targeted so your promotion could look very different. Ben Schlappig at One Mile at a Time received an offer that could earn as many as 55,000 IHG Reward points. According to Million Mile Secrets, some members have even received offers worth as many as 128,000 points! Since my maximum potential is 63,700 points, I am pretty pleased! Starwood, Hilton and IHG are all competing for your winter and early spring business with bonus point offers. If you are a heavy traveler, the Starwood and Hilton offers could be more lucrative since you can earn double points throughout the offer period. However, for less frequent travelers like myself, completing certain types of stays with IHG has significant bonus point opportunity. Though it is unlikely I will travel much during this period, I have signed up for all three. I have read blog posts wondering whether to sign up for a particular offer. Why not? So long as there is no cost to register and it only takes minutes, I see no downside. Then, if you complete a stay at a chain during the offer period, you don't risk leaving bonus points on the table by forgetting to go back and register later. My philosophy for any promotion like these is to always register. You may be pleasantly surprised after a stay to see extra points appear in your account that you had forgotten you could earn!